A decade ago, a network of foundations, organizations, and local institutions committed to expanding jobs and opportunities in five poor neighborhoods in Cleveland's Greater University Circle. Is it working? Cleveland, Ohio has long epitomized the tragedy of the nation’s rustbelt: lost industry with few new opportunities to support a declining population. Even before the Great Recession, systemic changes in Cleveland were necessary if the city was to break from its trajectory of increasing poverty and urban decay. In 2005, a new model of development began to emerge, attracting national attention and providing reasons for optimism about the city’s future. The center of University Circle is the home of three big anchor institutions: University Hospital (foreground), Case Western Reserve University (with its metallic-roofed Frank Gehry-designed management school) and Cleveland Clinic (off camera to the left). Case Western Reserve University, with a staff of more than 6,000 and an annual budget topping $1 billion, offers huge economic opportunity for local residents. Efforts to green abandoned lots and create new parklands have help the Greater University Circle neighborhoods stem the tide of urban decay and outmigration in Cleveland. Volunteers painted a new mural around the Moreland Theater in the Buckeye neighborhood, a project funded by community grants from Neighborhood Connections, a key Greater University Circle Initiative partner. Arts funding has risen significantly under the initiative. Dancers from the Djapo Cultural Arts Institute, here performing at the Cleveland Art Museum, have been beneficiaries of arts funding through the initiative. The Fairbax neighborhood has been the site of intensive rehabilitation and new construction as part of the initiative. Participatory mapping programs have allowed community leaders to have a greater voice in initiative planning. The mapping exercises have also built cohesion among long-time neighbors in the surrounding communities. GUCI has offered homeowner incentives to invest in neighborhoods around the University Circle, and commercial districts such as Little Italy have grown more vibrant. GUCI leaders are so far not concerned about effects of gentrification – citing an overall depopulation in inner Cleveland that still hasn’t been reversed. An employment program trains University Circle neighbors to work in Evergreen Laundry, one of three cooperatives that serve the main anchor institutions. Trainees learn solar installation techniques in preparation for working at Evergreen Energy Solutions, a local cooperative. Here, an Evergreen Energy Solutions employee is placing panels on top of the Cleveland Clinic garage. Evergreen has installed panels for all three institutions and also provides building energy use assessments, insulation installment, and other building improvements to reduce energy use. NewBridge has trained more than 60 local residents to be pharmacy and phlebotomy technicians since 2011, with the majority going on to employment at University Hospital or the Cleveland Clinic. Public investments in infrastructure, such as new rapid transit stops, have paralleled the initiative’s work. Neighborhood Connections arts funding recipients gather at a celebration. The Future Economy analysis found that community organizations have gained greater influence over the GUCI network over time. Local hiring has been the most successful aspect of the initiative in recent years: In 2013, the hospital and clinic hired more than 500 people from surrounding neighborhoods in less than one year—hitting the decadal goal. 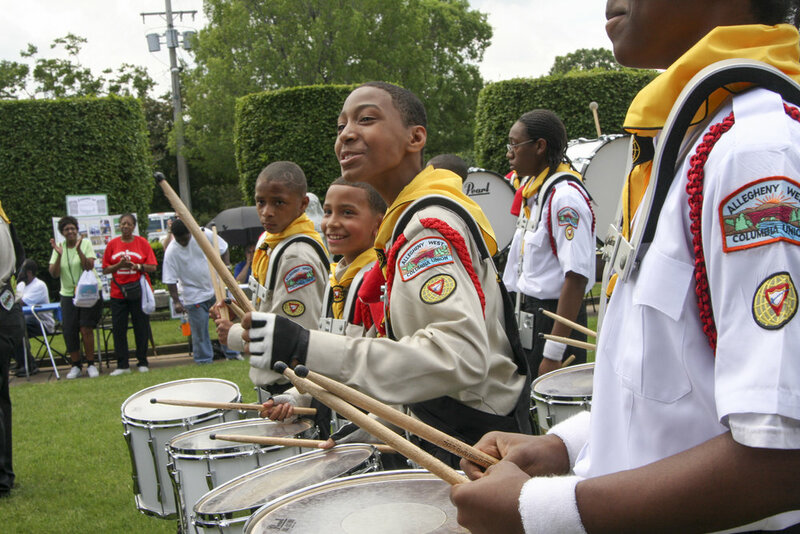 Investments in neighborhood and arts activities have further strengthened the communities. Our case study shows that while the leadership structure of GUCI remains mostly top-down, the initiative has made great strides in breaking down the invisible divide that exists between the wealthy University Circle institutions and the surrounding low income neighborhoods. There are many aspects of the initiative that suggest longevity and replicability, and which promote the creation of an economy where growth reflects a concern for environmental impact and an equitable distribution of resources. Julia Poznik is completing an interdisciplinary Ph.D. in economics and the social sciences at the University of Missouri Kansas City. Her areas of focus are political economy, alternative business models, and heterodox microeconomics. She is currently researching the intersections between social institutions, such as white privilege and patriarchy, and democracy in the workplace. Development in Cleveland through the Multi-anchor Model (pdf). Jonathan Ramse is an interdisciplinary Ph.D. student studying economics and social science at the University of Missouri Kansas City. His study and research interests include economic and community development, participatory methods and alternative measures of human well-being. Ruchira Sen is an interdisciplinary Ph.D. student studying economics and social science at the University of Missouri Kansas City. Her interests are in political economy, Marxian social theory, and the history of organizing to create a socially just economic system. Corporate and editorial photographer Janet Century has a passion for capturing moments of the human experience which have a strong social narrative which informs and incites empathy. Based in Cleveland, Janet’s body of work includes fine art photography as well as photojournalism and community work, environmental portraits, travel, landscape and events.